Need a top cover (the metal one - not the canvas cover) for a R-442. 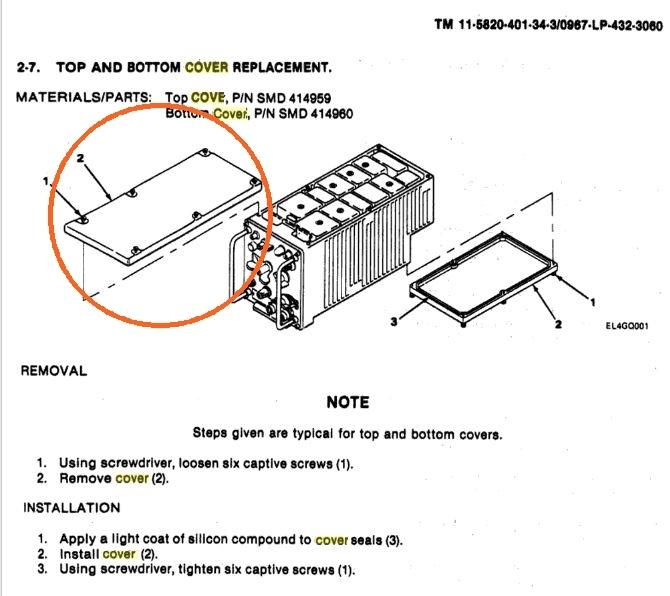 I am unaware of a metal top cover specifically for an R442. The KY metal enclosure around the 524 and 442? Can't remember if that covers the 442 also. The metal three sided "box" that goes over the MT1029 mount (which would have either an RT246 or an RT524, -or I guess a PRC25/77 in its mount) usually had the KY encryption stuff bolted on top. That particular "box" does not cover an R442 mounted next to the MT1029. I have seen several times another MT1029 mounted on top of the "box", stacking an RT246 and/or an RT524-especially when used as a re-trans unit. I have never seen nor heard of a metal box to cover the R442. Man, that is a load on that fender! That is 130 lbs. of radios plus the weight of the mounts and the box. I'll bet every bit of 165-170 lbs. Not to lean off the original topic, but Mutts had GRC106's mounted on a fender, didn't they? Those, even without the modem, were probably well over 100 pounds. If you think about it, that would be close to the same as a guy sitting on a fender. Ok, back on topic. I looked through a handful of TM'S and saw no mention of metal boxes. Please have a look at http://armyvehicles.dk/vhf_images/r442.jpg - that´s what I´m looking for. Ohhhhhhhhhh, you need the top lid for the unit itself.